Where did the idea of holding a symposium come from? Marie Meyer, an artist and author of the Multi-Brand Color Chart for pastels, contacted the ISCC and AIC last year to ask if there were any plans to celebrate Munsell’s anniversary in 2018. The Munsell Color Company was founded in Boston in February of 1918, and Munsell died in June of the same year. 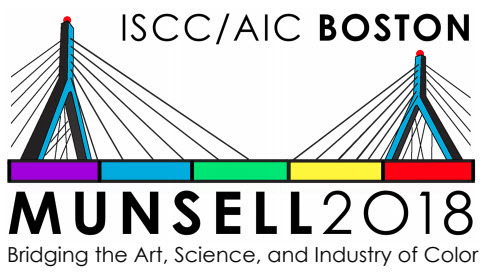 Paula Alessi, the ISCC newsletter editor and executive board member of the AIC, loved the idea of a Munsell centennial celebration, and proposed the ISCC annual meeting of 2018 be organized as a joint ISCC/AIC special event to honor Munsell’s contributions to the science, art and and industry of color. The AIC was brought on because of the use of the Munsell system worldwide. Scientist Paula Alessi, wanted to bridge the gap, just as Munsell did, between the arts and sciences. To do this, she brought in artist Maggie Maggio, a huge Munsell fan and chairperson with prior experience organizing events, to help her pull it all together. What is the ISCC & the AIC? The ISCC is the principal professional society in the field of color in the United States. It was created in 1931 to advance the understanding and application of visual color as it relates to science, art and industry. The goals of the AIC and its members are to encourage research in all aspects of color, to disseminate the knowledge gained from this research, and to promote its application to the solution of problems in the fields of science, art, design and industry on an international basis. In addition to their involvement with the Munsell symposium, they will be holding an interim meeting in September in Lisbon to continue their goal of bringing together a multidisciplinary group of specialists to discuss color. What are the goals of the symposium? To build bridges between the science, art and industry of color and to promote color communication across disciplines. Color professionals can be found in all walks of life. Scientists conduct color research in many fields including physics, chemistry, biology, neurology, anthropology, and psychology. Artists and designers use color everyday in their work, and every industry and manufacturer has color specialists who insure that products meet strict color standards. Many of these individuals use the Munsell system in their respective fields. We want to bring them together to share their expertise and experience! Currently the ISCC members are mostly comprised of technical color experts. By expanding their reach to artists and designers, the aim is to invoke a more lively, and versatile discussion. The language of color can be so different between disciplines, so by including a wide range of people working with color, we can show how they are interrelated, and how inter-disciplinary communication can help re-energize the color conversation. We are facing the same kind of challenges now that we faced 100 years ago, which is a lack of a way to communicate across disciplines. By bringing everyone to the table, and encouraging these conversations, this will truly be a celebration of the past, with an aim to looks toward the future. Why is the symposium being held at MASS Art? MassArt – the Massachusetts College of Art and Design – was the first place we looked. MassArt was known as the Massachusetts Normal Art School when Munsell was an art student and he taught there for 37 years. We wanted to make the event affordable for everyone including students so the idea of hosting the symposium at a college campus rather than a conference center made sense. MassArt has been extremely helpful in the planning stages. Attendees will be able to stay for the full week in the new Treehouse dorm across the street for the same price as just one night in a local hotel. How will the symposium bridge the past with our color world today? The program committee decided on the format for the symposium – three days of general session talks (one day each science, art and industry) and two days of breakout sessions – early in the planning stages. The three days of talks are each divided into the AM talks – Celebrating the Past, and the afternoon talks – Envisioning the Future. Once the format was in place, we invited the presenters who we thought best fit the themes of the program for that day and whose talks would inspire cross-disciplinary discussions to help bridge the past and future. What are some of the program highlights? In addition to the three-days of inspiring and discussion provoking general session talks there will be two days of breakout sessions that include hands-on workshops, tutorials and field trips to museums in Boston and Cambridge. These sessions will be a great opportunity for artists and scientists to share notes and explore color together in smaller groups than in the large Tower auditorium. At the end of the breakout sessions on Tuesday, everyone will get together in Pozen Center at Mass Art for the Awards banquet honoring Rolf Kuehni, Joy Turner Luke and Calvin McCamy for their lifetime of achievements in color science, art and industry. The keynote speaker at the banquet will be John Seymour, better known as John the Math Guy. He’s told me a little bit about how his talk will go and I can assure you – it will be both educational and hilarious! All color professionals and color enthusiasts, including those who are huge Munsell fans and those who might not know about Munsell but want to learn more about his influence on present day color systems. The morning programs will be focused on Munsell’s legacy and the afternoon programs will focus on present trends and future possibilities so the event is also for anyone, in any field, who is curious about what is happening in the world of color in the 21st century. Students are strongly encouraged to attend. They will have the opportunity to meet all of these passionate people, across many disciplines, who use color in their everyday lives. Students will be able to see all of the different possibilities for a career path in color communication. Maggie is looking forward to meeting and talking to so many people who share a passion for color! She is especially excited to go to the workshop and talk by Setsuko Horiguchi from the Nippon Color and Design Research Institute (NCD) of Japan which was founded by Shigenobu Kobayashi. Maggie is thrilled to be able to see how his system – which evolved from the Munsell system – is currently practiced in Japan. Paula is excited to be a part of the international flavor of this meeting. So often it is the case that we get tunnel vision within our own organizations. She is so curious to hear from people all around the world on how they are using the Munsell system today and use these discussions as a means to frame the history, evolution, and current state towards a prediction for the future. We are both eager to see the finalized special exhibit at the Doran Gallery of classical, realist artists who use the Munsell system in their paintings. Paula and Maggie have been working together as co-chairs of the event, even though they are on opposite sides of the country. 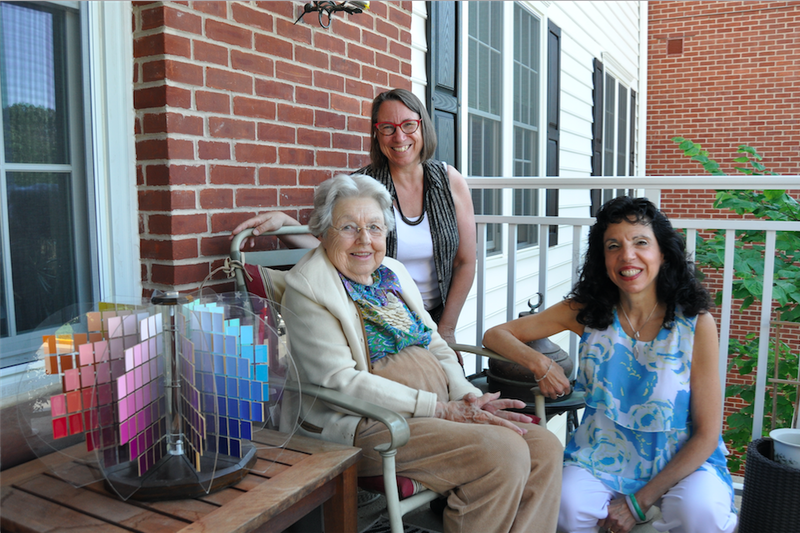 This summer, they got together to visit and interview Joy Turner Luke in Virginia. She is a presenter and also the recipient of the Munsell Centennial Award in Art. Maggie flew in from Portland, Oregon, Paula and her husband drove down from Rochester, NY. There is a call for poster papers that will go into peer review. These will be published in a special Color Research and Application Journal. There will be Munsell prizes awarded to the best paper contributed by a student or group of students. Deadline for abstracts is December 15th and you can find more information here. 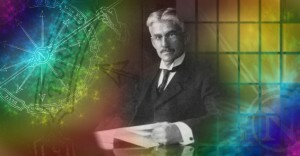 This is a one time only event – if you are a fan of Munsell don’t miss it! Registration opens December 1st. After 32 years as a research color scientist at Eastman Kodak Company, Paula Alessi retired in January, 2012. She received a M.S degree in color science from Rensselaer Polytechnic Institute after studying with Dr. Fred W. Billmeyer, Jr. She has been a member of ISCC since 1977. Her career at Kodak featured work on optimizing color reproduction of Kodak film/paper systems and motion picture film systems. She gave color reproduction tutorials to chemists and film-builders to help them do a better job of building their chemicals based on desirable spectral properties and building their films based on producing colors that would beat the competition, especially for color gamut. She did both national and international color standards work mostly in the area of color management systems for Kodak. Her work also featured hardcopy/softcopy color appearance matching studies and prototypes for CRT to print and backlit film comparisons under a variety of viewing conditions. Paula also worked on optimizing the color characteristics of Kodak’s patented Organic Light-Emitting Diode displays. Finally, Paula ended her Kodak career working on maximizing the color gamut of CMYK high speed drop on demand commercial inkjet printers while minimizing physical defects on the paper. She is the author or co-author of 14 patents on behalf of Kodak. She has been active in CIE since she started doing the hardcopy/softcopy matching work in the early 1990’s. She is currently the CIE Division 1 USA alternate voting representative. She has had the honor of serving on the ISCC Board of Directors twice and being its President. She has received the ISCC Nickerson Service Award. Paula has also had the honor of serving on the AIC Executive Committee and serving as its President. Currently, she is the ISCC liaison to AIC and the ISCC Newsletter Editor. She is committed to helping ISCC transition into an organization that can better serve its 21 st century members. She has always been passionate about color in every aspect of her life. Paula would like to keep that passion moving forward with her ISCC/AIC friends as new technologies and methods of communication develop. Maggie Maggio is an architectural designer, artist and art educator who has studied and played with color for over forty years. Her personal explorations into the science of light and pigments led to the creation of “Smashing Color” workshops for artists and designers who want to learn more about 21st Century Color. A life-long artist, Maggie now creates contemporary art jeweler in polymer clay. She believes polymer is perfect for color explorations because it is “color you can hold in your hands.” Her pioneering work in polymer clay is included in museum collections and collected internationally. Maggie and Lindly Hanauni are co-authors of the book Polymer Clay Color Inspirations, published by Random House in 2009. Maggie retired from architecture in 2015 and now focuses her time on guiding artists and designers in their explorations of the world of color and researching how color concepts are taught to children world-wide. Maggie lives in Portland, Oregon – which she considers one of the most colorful cities in the world.